Monday April 3 1911 This would have been Bro Robs birth-day. I was sewing all day in a summer dress I am fixing. Tuesday April 4 1911 I was sewing all day finished my dress and was changing a dressing [sacque?] to wear every day. Weather stormy. 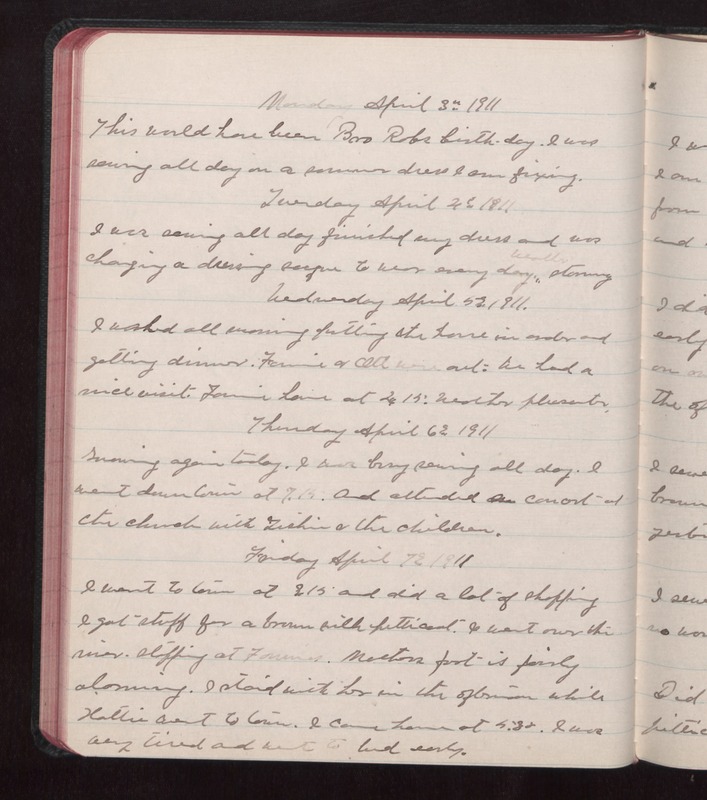 Wednesday April 5 1911 I washed all morning putting the house in order and getting dinner. Fannie & Ott were out. We had a nice visit. Fannie home at 4.15. Weather pleasanter. Thursday April 6 1911 Snowing again today. I was busy sewing all day. I went down town at 7.15. And attended a concert at the church with Tishie & the children. Friday April 7 1911 I went to town at 9.15 and did a lot of shopping I got stuff for a brown silk petticoat. I went over the [illegible] at Fannies. Mothers foot is fairly [alarming?] I staid with her in the afternoon while Hattie went to town. I came home at 5.30. I was very tired and went to bed early.